After the Windows 10 upgrade process completes, my rear Dolby Surround Sound 5.1 speakers don’t work. I found out about the issue when iTunes and Windows Media player didn’t play sound out of the rear speakers after the upgrade. The speakers produce sound when they are tested in Control Panel/Sound/Manage Audio Devices/Configure, but the applications do not seem to use them. How can I get the applications to use all the speakers? When troubleshooting computer gremlins, technicians lump problems into two general categories: Hardware and software. I also include a third category called firmware, but that’s besides the point. The computer was upgraded to Windows 10. Audio is not working in applications. Audio works when tested in Manage Audio Devices. Judging from the fact that your audio worked before the upgrade, we can safely speculate that the problem originates with the software and not hardware or firmware. Based on this data, we want to narrow the potential causes down through testing (which you’ve already done). We know that the Operating System (OS) recognizes the audio drivers, but for some unknown reason the OS doesn’t default to the correct audio hardware. For the sake of comprehensiveness, we’ll first cover a factor that complicates OS upgrades: An audio sub-system can consist of several kinds of audio outputs, which depends on your motherboard or any internal or external audio devices plugged into your rig. You can pick any of these components as the default audio device. There’s a few complicating factors that can dramatically reduce the likelihood of a successful upgrade. The older a computer, the more archaic its audio subsystem. The big divide occurred when Intel and AMD moved from discrete audio systems, with its own audio chip on the motherboard, to system-on-a-chip (SoC) technology, which integrates the audio subsystem onto the CPU die. When this shift occurred, it greatly simplified the drivers involved, which made hardware upgrades easier, since they dealt with fewer chipset providers. Normally, I would suggest that you check Windows Device Manager to see if any devices aren’t recognized by Windows 10. In your case, though, these driver should be recognizable to the OS. In Windows 10, type Device Manager into the Search bar. Device Manager should reveal itself at the top of the screen. Select it with a left-click. First, type Sound into the Windows Search bar. Next, select Sound located at the top of the results. In the Sound settings menu, you’ll notice multiple audio devices. You didn’t indicate the specific audio output you were using, but whatever it is, you would select Set Default and hit OKfrom the bottom of the screen. It sounds as if you missed this very crucial step. If you did, the issue would appear identical to your own. Microsoft recommends, in this case, updating your device driver. However, your audio appears to already work, so we won’t cover that step in lavish detail. The quickest way to update an audio driver in Windows 10 is to right-click on it in device manager and select Update Driver. Sometimes, uninstalling and reinstalling an audio driver can solve the issue. Since it’s the rear audio ports which don’t work, you might want to consider uninstalling them in Device Manager, restarting the computer, which should automatically reinstall the drivers. Normally, we would start with a diagnostic related to the various subsystems of Windows audio. However, as you’ve already mentioned, Windows 10 produces sound, but applications do not. Others may have experienced the same issue when upgrading to Windows 10. 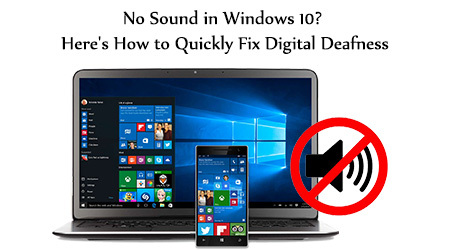 My colleague Bruce Epper suggests using the Windows 10 forums, located over at Microsoft and searching for “Windows 10 audio” to see if any hits show up. A quick scan of the Windows 10 Insider forums reveals several topics similar to your own. There’s a virtual maze of potential fixes, but don’t get discouraged. There’s probably an answer out there, if you look hard enough.We Can Help You Too! We helped this reader. We can help you, too. Got a burning question, or a tech problem you need solved? Just click the button above! And, of course, please leave any feedback or comments in the comments below! Tip 1: If you get some MKV, FLV, M4V, WMV, MOV, MP4, Tivo, XAVC, M2TS, H.265 etc. videos, and have trouble to convert them to AVI on Windows 10 Supported formats, you’re in the right place. Similarly, we need to solve the problem is still compatible format. You can get Pavtube Video Converter Ultimate. A powerful all-in-one tool to convert HD/4K videos, Blu-ray movies and DVDs to MP4, AVI, WMV, MOV, MPEG, Surface Pro 4, iPhone 6S/6S Plus, Samsung Galaxy S6/S6 Edge, Sony Xperia, Google Nexus, Windows Phone, PS4, Xbox etc, and deliver high quality video/audio quality at fast conversion speed for playing nicely. Free try this software and follow the steps to try it out now! Tip 2: There are a lot of users want to know the way to remove DRM protection from iTunes movies or TV shows and turn them into MP4 for Windows 10, here I will share the best iTunes DRM removal software with you – Pavtube ChewTune. It’s an easy-to-use and intuitive DRM removal tool that can legally produce a DRM-free copy of the original. Specially designed to convert iTunes movies and music to any format on Windows 10 you like. with the fastest speed and best video/audio parameter settings. Free try this software and follow the steps to try it out now!